You already created an Excel table, but now want to make it easier to read and understand. To accomplish that, you want to format it by drawing various borders. In this learning module, you will find out how to apply excel borders to cells or cell ranges. HOW DOES EXCEL BORDERS WORK? When working with Excel borders, gridlines are usually visible on your screen. However, by default, they are not printed. And if you assign a background color to a cell, the gridlines will be hidden from view. If you want to add a printable excel border to some parts of your table, however, just select the cell or cell range around which you want to apply the border. Then – on the Home tab, in the Font group – click the small black arrow next to the Borders button . The Excel Borders selection list will appear. Most of the options in this list draw excel borders around the perimeter of the selected range. The button is different: it causes a thin border to be drawn around every cell in the selected range. Click the border style you want to use. 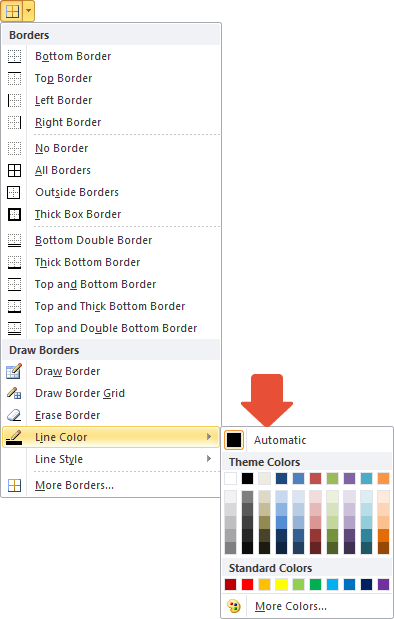 The symbol for your chosen border style replaces the previous symbol on the Borders button. For that reason, if you want apply the last-used border style again, you don’t have to reopen the selection list, just click the main button again. 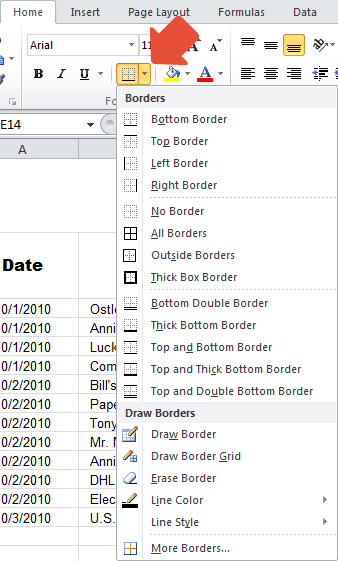 In addition to the border styles predefined by Excel, you can also specify borders individually. Do do so, select the relevant cell range. Then – on the Home tab in the Font group – click the arrow on the Borders button and select . You can draw border lines in the right-hand area of this dialog box. Any borders you specify will appear in the small preview. 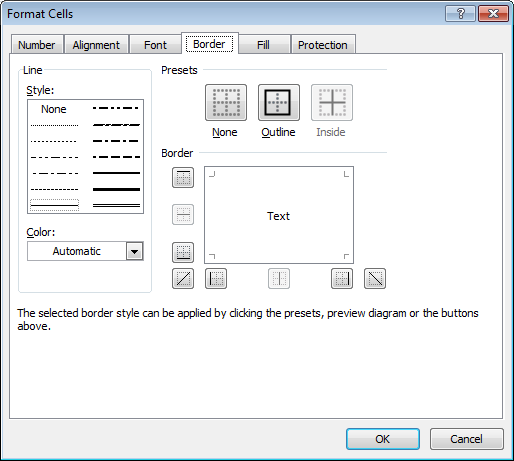 You can also format cell borders by right-clicking in the selected range. When you click the Format Cells… option in the context menu, the Format Cells dialog box will open. There you can make your settings on the excel Border tab. Select a line style by clicking on it. You can set border lines quickly by selecting Outside, Inside or None from the Presets area. You can specify Outside and Inside together if you like. 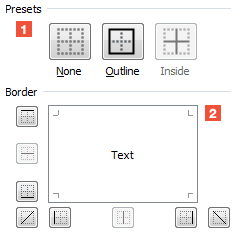 You can also use the buttons in the excel Border area to set individual border lines. You can also click directly on the preview area to apply the currently selected line style. …and choose a color by clicking on it. Once you’ve made all your settings, close the dialog box by clicking . 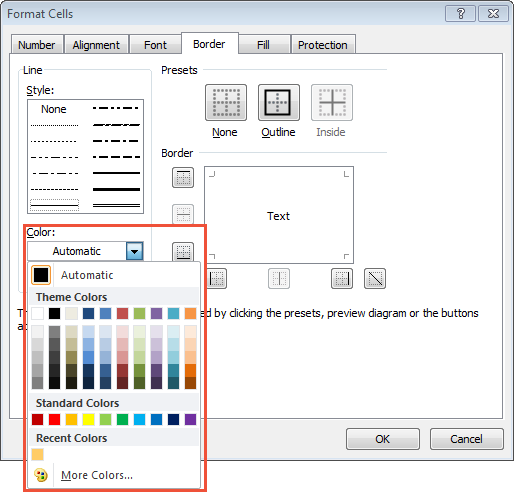 You can also choose a color in the excel Borders selection list. If you select a line color in this fashion, the mouse pointer will turn into a pen that you can use to draw any number of lines directly on your table. To exit this tool, press the [Esc] key. The last color selected remains in effect until you select another color or restart Excel. If you want to remove borders, choose or from the selection list. When you choose Erase Border, the mouse pointer turns into an eraser with which you can rub out border lines. To exit the eraser tool, press the [Esc] key.